For the mountain range in Antarctica, see Columbia Mountains (Antarctica). Location map of Columbia Mountains: dotted lines to left mark boundaries of Okanagan, Shuswap and Quesnel Highlands, dotted lines to lower right mark Salish and Cabinet Mountains. Monashee Mountains, on the right of Kinbasket Lake. The Monashees are a major subrange of Columbia Mountains. 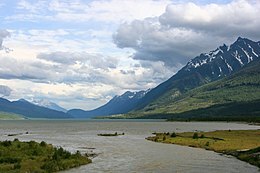 The Columbia Mountains are a group of mountain ranges along the upper Columbia River in southeastern British Columbia, and also in Montana, Idaho and Washington. The mountain range covers 135,952 km² (52,491 sq mi). The range is bounded by the Rocky Mountain Trench on the east, and the Kootenay River on the south; their western boundary is the edge of the Interior Plateau. Seventy-five percent of the range is located in Canada and the remaining twenty-five percent in the United States; American geographic classifications place the Columbia Mountains as part of the Rocky Mountains complex, but this designation does not apply in Canada (despite a British Columbia government tourism campaign to rebrand their southern portion as the "Kootenay Rockies"). Mount Sir Sandford is the highest mountain in the range, reaching 3,519 metres (11,545 ft). Some classification systems end the Columbia Mountains at the North Thompson River, such that the Cariboo Mountains are assigned to the Interior Plateau. Where the Columbia Mountains meet the Interior Plateau there are intermediary areas known as highlands - the Quesnel Highland (west flank of the Cariboos), the Shuswap Highland (south of the Cariboos and west of the northern Monashees), and the Okanagan Highland (west of the southern Monashees). These are listed here but are often considered to be part of the Interior Plateau. Some geographic classifications also include the Cabinet Mountains and Salish Mountains, which lie south of the Purcells between the Kootenai River and the Clark Fork of the Columbia, but in US classification systems they are generally considered to be part of the Rocky Mountains. Physiographically, they are a distinct province of the larger Rocky Mountain System physiographic division. The following mountains are the 10 highest mountains (in order) contained within the Columbian Mountains: "Columbia Mountains". Peakbagger.com. "Columbia Mountains". BC Geographical Names.